Apple announced their new MacBook at their Apple Watch event yesterday and now we have the full specifications on the newly designed Apple MacBook. The new Apple MacBook features a 12 inc Retina Display that has a resolution of 2304 x 1440 pixels and it features 226 pixels per inch and a 16:10 aspect ratio, the device is considerably thinner and lighter than the previous MacBook range. The new MacBook measures 13.1mm thick and weighs in at just 2lbs and Apple has removed the majority of the ports on the device and it now comes with a new USB-C port and a single headphone port. Apple’s new MacBook USB-C port is used to connect devices to your MacBook and it is also used to charge the notebook, the company will also sell you an accessory which lets you connect a number of additional devices to the USB-C port and this will cost you an extra $79.00. Processing on the updated MacBook comes in the form of either a 1.1GHz dual Core Intel M processor, there is also options to update this to a 1.3GHz dual core Intel M processor and this model features 256GB of solid state storage. The second model in the new MacBook range comes with a dual core 1.2GHz Intel Core M processor, this can also be configured to a 1.3GHz processor and this version comes with a 512GB SSD, both models feature 8GB of 1600MHz LPDDR3 RAM. The new MacBook comes with Intel HD graphics 5300 which supports full resolution on the built in display and up to 3840 x 2160 pixels on the external display. The device also comes with a 480p Apple FaceTime camera and it features a set of stereo speakers and dual microphones. Apple has also changed the keyboard design on their latest MacBook which now come with individual LED backlit keys and there is also a new Force Touch trackpad. The batteries on the MacBook will give you up to 9 hours of usage using WiFi on the web, and up to 109 hours of iTunes movie playback. 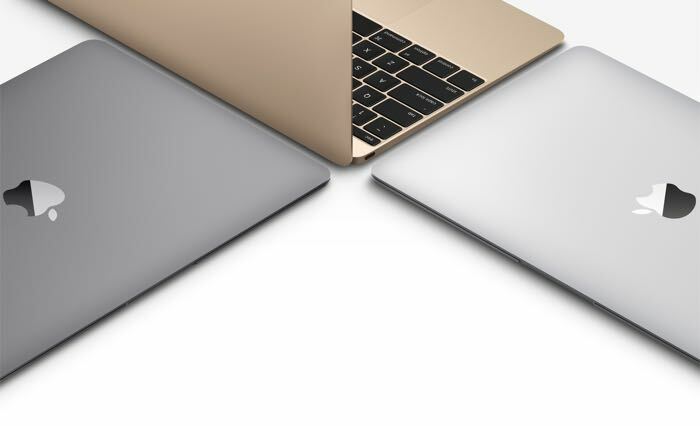 The new Apple MacBook now comes in three colors just like the iPhone and iPad which includes Silver, Space Gray and Gold, prices for the MackBook starts at $1299 for the entry level model and $1599 for the top model, you can find out more details at the link below.